Walking holidays can mean very different things to different people. Some are simply looking for a chance to escape to somewhere peaceful and to meet other walkers whilst strolling a few miles each day whilst others may be looking for more challenging treks which push them to their limits. Therefore it’s important to establish what kind of walking holiday you want first of all. Where do I want to walk? How difficult and/or strenuous do I want the walk to be? How many miles/hours a day do I want to walk? Am I fit enough to do this particular walk? Do I simply want to go with family or friends or do I want to meet new people and arrange a walking holiday with a specialist company? What meals are provided and what’s the accommodation going to consist of? There may also be other questions you’ll want answering which might have a bearing on the type of holiday you choose. Some walking holidays will consist of gentle hikes which don’t need too much effort combined with another interest such as bird watching, photography, literature etc. whilst others will be far more challenging, perhaps trekking for miles over difficult terrain. Some will be guided by a trip leader and others will enable you to walk within your own groups pretty much freely, following a map and some basic guidelines which are given to you. Some trips will lead you back to ‘base’ each evening. In other words, the hotel or other lodgings you’re staying at, whilst others may consist of a longer route between point A and point B where you might stay in different places each night until you reach your ultimate destination at the end. Your luggage will be transported ahead of you in many instances so that you don’t have to carry a heavy backpack. Some people will prefer to walk in the UK whilst others may want to seek out more adventurous treks abroad. Whatever your trip consists of, however, the holiday provider should take care of the entire organisation for you. 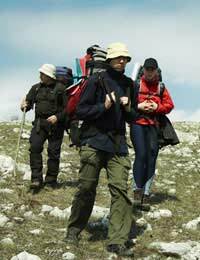 Many companies who specialise in walking holidays will ‘grade’ each particular walk into different ‘degree of difficulty’ categories. This will take into account things like the distance to be walked, the type of terrain – for example, whether it’s rocky or smooth, if there are any ascents to be made etc, what level of fitness and/or experience is expected. They might categorise these into gentle, intermediate and tough, for example. These days, walking holidays needn’t be just about ‘roughing it’ in tents and warming up a tin of beans on a camping stove at a campsite at the end of day. Indeed, some walking holidays involve staying in a different country pub each night and range up to 5 star luxury hotel accommodations so you should find one that suits you. Many people who choose to go on a walking holiday for the first time will tell you that having a guide or trip leader is very useful. They will be able to point out places to go and things of interest to see which will add to the enjoyment of your holiday. Depending on your preference, you may want to walk in a larger group as you may feel that would be more fun and interesting or you may prefer the more intimate setting of walking in a much smaller group. The choice is yours. Ultimately, however, a good walking holiday should consist of good accommodation, good food, good company and, of course, good walking.